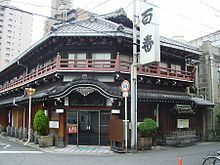 Tobita Shinchi (飛田新地), also known as Tobita Yūkaku (飛田遊廓), is the largest of the brothel districts in Osaka, and also the largest in western Japan. It is located in the Sanno 3-chōme area of Nishinari-ku, Osaka. Tobita Shinchi dates from the Taishō period. To circumvent the anti-prostitution laws, the brothels operate largely under the guise of being "Japanese-style restaurants" (Ryoutei). The area consists of three main streets: Youth Street (青春通り Seishun Doori), Main Street (メイン通り Mein Doori) and Big Gate Street (大門通り Ohmon Doori). Tobita brothels, similar to how brothels in Amsterdam have women in the windows, tend to have a young woman kneeling by the genkan (entryway) or in the living room (which is fully open to the street) of the brothel to attract customers—an unusual practice for brothels in Japan. Often the women are dressed as schoolgirl or nurse costumes. Most of the prostitutes are Japanese, although there are some zainichi (Koreans). An elderly woman called the 'Yarite Babaa’ or 'Mama-san', often the owner of the residence, sits in the genkan and greets male passers-by with phrases like douzo, onii-san (どうぞ、お兄さん, "Welcome, young man"). Many of the brothels will only accept Japanese or Asian clients. The area is popular with visitors from China, Taiwan and Korea. The nearest metro and mainline stations are Ebisuchō Station. One of the oldest buildings in the area, the Taiyoshi Hyaku, was given 'cultural property' status in 2000. It was originally built as a 21 room brothel in 1918 and was converted to a restaurant in 1970. The themed rooms of the brothel have been retained. On 16 January 1912, the red-light district of Shinchi Otobe in the Namba district of Osaka, containing 2,000 prostitutes and 100 brothels, burnt down. The brothels were moved the current Tobita Shinchi location after a cemetery was cleared from the grounds. The area is on the south side of the then newly built Shinsekai entertainment area, which was thought to be advantageous. However there were many protests from anti-prostitution campaigners to the setting up of the new brothel district. Tobita Shinchi was one of the last licensed Yūkaku areas to be created. The area escaped the bombing of Osaka during WW2, and continued to thrive until the Prostitution Prevention Law came into effect on 1 April 1958. However the area only closed for one night, the brothels re-opening as "restaurants" the next day. To circumvent the anti-prostitution laws, the brothels operate as restaurants. Tea and snacks are served the client in a private room. Subsequent sexual contact between the "waitress" and the client is viewed as a "private affair" between them under Osaka's liberal interpretation with the law. ^ a b c d e f Schonherr, Johannes. "Tobita Shinchi". Pink Visitor. Retrieved 20 December 2018. ^ a b Miyazaki, Jamie (19 August 2010). "A Red-Light District Off the Beaten Path". The Wall Street Journal. Retrieved 20 December 2018. ^ a b c d e f "The Definitive Guide to Tobita Shinchi Osaka". Osaka Bros. 20 January 2018. Retrieved 20 December 2018. ^ a b "Tobita Shinchi". www.japan-experience.com. Japan Experience. 16 December 2016. Retrieved 20 December 2018. ^ "Osaka travel guide area by area: Shinsekai, Tobita Shinchi - youinJapan.net". youinjapan.net. Retrieved 20 December 2018. ^ "Foreign tourists reshape Tobita Shinchi brothel quarter". newsonjapan.com. Retrieved 20 December 2018. ^ "Osaka, Japan – Red Light District (Tobita Shinchi)". The Whore Monger. 13 January 2017. Retrieved 20 December 2018. ^ a b c d e Moriguchi, Kenzo (26 March 1999). "Nostalgia buffs covet 1918 brothel-turned-eatery". The Japan Times Online. Retrieved 20 December 2018. ^ "橋下徹氏 大阪の旧遊郭街・飛田新地組合の顧問弁護士だった│NEWSポストセブン" [Toru Hashigashita Mr. Toru Hashashita was an adviser lawyer from Osaka's Old Pref]. www.news-postseven.com (in Japanese). 22 November 2011. Retrieved 20 December 2018. ^ "大阪旧遊郭街顧問弁護士の経歴もやり玉に 外国人記者らが橋下市長釈明を追及" [Osaka former amusement park corporate lawyer's career also jailbroke foreign journalists pursue the explanation of the mayor of the bridge]. J-CASTニュース (in Japanese). 27 May 2013. Retrieved 20 December 2018. Wikimedia Commons has media related to Tobita Shinchi. This page was last edited on 10 March 2019, at 22:31 (UTC).